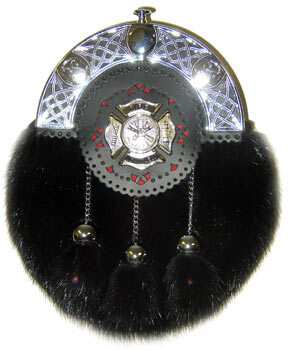 Our dress Firefighter sporran comes in both black or white fur with black fur tassles on chrome chain and ball bells. The cantle is chrome with a black leather targe and a Firefighters's badge surrounded by red accents. We are more than happy to mount your Department's badge on our sporran instead of our standard badge. Simply advise us of your choice at time of ordering and then ship your badge to our location and we will mount it during the manufacturing process.